Check out my brand new…crocs? The color here is pretty accurate...although perhaps a bit lighter than in real life. Anyways, I decided to look around on the internet just to see what sort of jelly shoes might be available these days. Of course.. in the last 11+ years my tastes have changed dramatically, and the pink & silver clunkers that made me happy at age 9-11, just don’t cut it anymore. Fortunately, it turns out there are a few jelly shoe options out there for women too! On Zappos I found a few, but they all seemed over priced and were often the “thong style” which I’m not terribly keen on. Amazon had a few others that I liked better, not to mention they were at a more reasonable price. I was kinda amazed to see that the style I liked best were actually a pair of crocs! Of course, I kinda knew crocs had moved on to more styles than those nasty, huge, stinky, clogs. But I hadn’t really paid much attention to the brand, as generally they aren’t really something that fits into my goth aesthetic. The pair I ended up ordering yesterday aren’t really very goth either, at least not by most people standards. But they are very ME. Although I had chosen the 2-day shipping option thanks to my Amazon Prime account, that shipping is free), I was pleasantly surprised when the shoes arrived today. Occasionally this happens, if it ships from the right distribution center 😛 … Oh BTW, the style is called “Adrina”. Anyways…. As for my thoughts on the shoes after having worn them for a few hours: They are definitely very comfy. The only gripe I have is that my heel tends to come out of them as a walk…. but I have that issue with pretty much all ballet-flat style shoes. 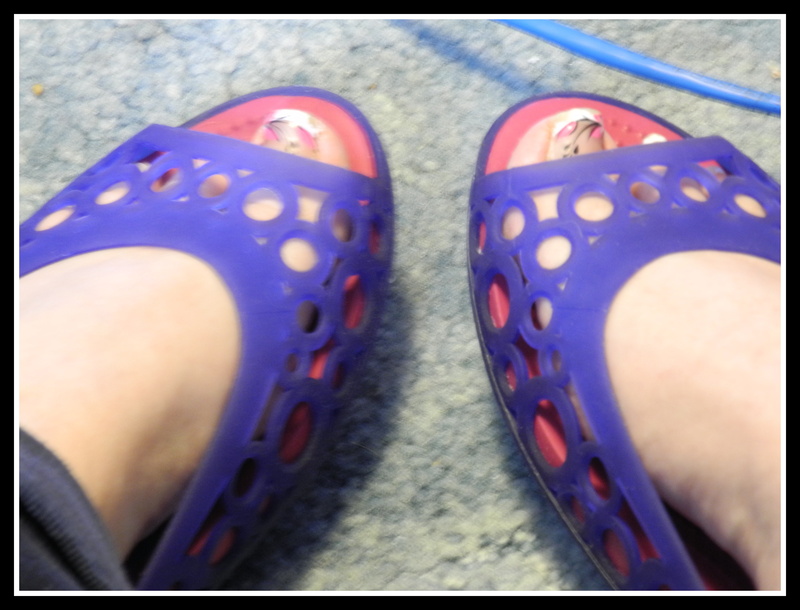 The positive side of that problem is: with these crocs, the plastic/rubber/whatever-it-is is soft enough that it doesn’t hurt my heels. With other ballet shoes (actually any slip-on type) I usually have to wear a band-aide or tape on my heel to avoid a bloody heel. Eh... taking pics while wearing them requires a better set-up than I had patience for... lol. So please excuse the not-so-great angle/focus... not to mention the chipped pedicure. Wow these crocs look good! Are they comfy? i sooo want a pair!